Returning to the Kaliyuga calendar, it is also perhaps of some significance that there is no corroboration of the use of the Kaliyuga calendar in the Vedas, which are generally taken to date from the second millennium BC. There is, in fact, plenty of calendrical discussions in the Vedas, and a clear exposition of a system in which each year consists of twelve months of 30 days, with a thirteenth (leap) month added every five years. While oldest of the Vedas, the Rigveda, outlines the main divisions of the solar year into months and seasons (four seasons of 90 days each), the more precise calculations, including the "leap" (or intercalary) months can be found in the Atharvaveda.5 But the exact accounting system used in the Kaliyuga calculations is not found anywhere in the Vedas — at least not in the versions that have come down to us. It appears that there is no overt or even covert reference to the Kaliyuga calendar in the Ramayana or the Mahabharata either. Consideration of this and other evidence even prompted Meghnad Saha and his collaborators in the Calendar Reform Committee to suggest that the Kaliyuga calendar might have taken its present form precisely at the time of Aryabhata, in 499 AD (indeed they speculated that its analytical system is "a pure astronomical fiction created for facilitating Hindu astronomical calculations and was designed to be correct only for 499 AD," p. 254). This may or may not be exactly right, but it is difficult to escape the conclusion that the Kaliyuga has not been in use much longer — if at all longer — than other old Indian calendars. The Vikram Samvat calendar, which is quite widely used in North India and in Gujarat, is traced to the reign of King Vikramaditya, and has a zero point at 57 BC. But many of the accounts of the magnificent Vikramaditya are so shrouded in mystery, and there is so little firm evidence of its early use, that it is difficult to be sure of the exact history of the Vikram Samvat. In contrast, however, we do know that the Saka calendar, which has a zero point (not necessarily its historical origin) in 78 AD, was in good use by 499 AD. Indeed, we know from Aryabhata’s own dating of the Kaliyuga in terms of the Saka era (421 Saka year) that at least by then the Saka era is well-known and in good use. While there is very little written evidence that survives on the use of the Saka calendar (or indeed any other old calendar), it is worth noting that the Badami inscription dating from 465 Saka era or 543 AD does confirm the use of the Saka era (not very long after the Aryabhata statement, dated at the 421st Saka year, or 499 AD). It is hard to resist the conclusion that unlike what appears from the table in Whitaker’s Almanac, the Kaliyuga is not a lone forerunner of all the other extant calendars. In fact, it is even possible that among the surviving calendars today, the Buddha Nirvana calendar (with a zero point in 544 BC) may actually be significantly older than the Kaliyuga calendar. And so, quite possibly, is the Mahavira Nirvana calendar of the Jains (with a zero point in 527 BC). While the first uses of these calendars are hard to identify, there is solid evidence of the use of the Buddha Nirvana calendar in Sri Lanka from the first century BC — earlier than any that point firmly to the use of the Kaliyuga calendar. Since I have been quite critical of the claims of priority of the Kaliyuga calendar as an old Indian calendar, I should make a couple of clarificatory observations, to prevent misunderstandings. First, it is not my purpose to deny that the Kaliyuga calendar may have a very old lineage. There is much evidence that it draws on older Indian calendars, including those discussed in the Vedas. But this ancient Indian inheritance is shared also by the Buddha Nirvana calendar and the Mahavira Nirvana calendar. We have to remember that ancient India is not just Hindu India, and there is an ancestry that is shared by several different religions that had their origin or flowering in India. The often-repeated belief that India was a ‘Hindu country’ before Islam arrived is, of course, a pure illusion, and the calendrical story fits well into what we know from other fields of Indian history. Second, even though the sensual pleasure of celebrating the completion of the sixth Indian millennium compared with the ending of the second Gregorian millennium may be denied to the Indian chauvinist, it is clear that by the time of the origin of Christianity, there were several calendars competing for attention in the subcontinent. What are now known as Christian calendars did not, of course, take that form until much later, but even the Roman calendars on which the Christian calendars (including the Gregorian) draw were going through formative stages over the first millennium BC, precisely when the inheritance of the old Indian calendars was also getting sorted out. There is indeed much give and take between the older civilisations over this period, and it is difficult to separate out what emerged through an indigenous process in the subcontinent — or anywhere else — from what was learnt by one culture from another. There is evidence that Indians got quite a few of their ideas from the Greeks (there are several fairly explicit acknowledgments of that in the Siddhantas), as did the Romans, but then the Greeks too had insisted that they had received a number of ideas from Indian works. As Severus Sebokt, the Syrian bishop said, in 662 AD (in a different country, in a different context), "There are also others who know something." If the Kaliyuga calendar loses its pre-eminence in critical scrutiny, the temptations of national chauvinism does much worse (while Hindu Chauvinism does worse still). The immense variety of systematic calendars in India brings out an important aspect of the country, in particular its cultural and regional variation. And yet this can scarcely be the whole story, since despite this high variance, there is a concept of the country as a unit that has survived through history. To be sure, the presence of this concept is exactly what is denied in the often-repeated claim that India was no more than a large territory of small to medium fragments, united together, later on, by the cementing powers of British rule. The British often see themselves as having ‘authored’ India, and this claim to imaginative creation fits well into Winston Churchill’s belief that India had no greater unity than the Equator had. It is, however, of some significance that even those who see no pre-British unity in India have no great difficulty in generalising about the quality of Indians as a people (even Churchill could not resist articulating his view that Indians were "the beastliest people in the world, next to the Germans"). Generalisations about Indians have gone on from the ancient days of Alexander the Great and Apollonius (an early ‘India expert’) to the ‘medieval’ days of Arab and Iranian visitors (who wrote so much about the land and the people) to the early modern days of Herder, Schlegel, Schelling and Schopenhauer. It is also worth noting that an ambitious emperor — whether Chandragupta or Ashoka or Alauddin or Akbar — has tended to assume that the empire was not complete until the bulk of the country was under his rule. Obviously, we would not expect to see, historically, a pre-existing ‘Indian nation’, in the modern sense, waiting anxiously to leap into becoming a nation-state, but it is difficult to miss the social and cultural linkages and identities that could serve as the basis of one. To this much debated issue, we can ask, what does the calendrical perspective bring? The variety of calendars, divided not only by religious connections but also by regional diversity, seems to be deeply hostile to any view of Indian unity. However, it must be noted in this context that many of these calendars have strong similarities, in terms of months, and also the beginning of the year. For example, the Kaliyuga, the Vikram Samvat, the Saka, the Bengali San and several other calendars begin very close to each other in the middle of April. There is evidence that their respective beginnings were typically fixed at the same point, the vernal equinox, from which they have moved over the long stretch of time in the last two millennia, during which the ‘correction’ for the integer value of the length of the year in terms of days has been slightly inadequate — again in much the same way. The fact that the integer value of 365 days to the year is only approximate was, of course, known to the Indian mathematicians who constructed the calendars. To compensate for this, the periodic adjustments standardly used in many of the Indian calendars take the form of adding a leap or intercalary month (called a ‘mala masa’) to bring practice in line with the dictates of computation. But the adequacy of the correction depends on getting the length of the year exactly right, and this was difficult to do with the instruments and understanding at the time the respective calendars were initiated or reformed. Indeed, the sixth century mathematician Varahamihira gave 365.25875 days as the true measure of the year, which while close enough, was still slightly wrong, since the length of the sidereal year is 365.25636 days and the tropical year is 365.24220 days. The errors have moved the different north Indian calendars away from the intended fixed points, such as the vernal equinox, but they have tended to move together, with considerable solidarity with each other. There are, of course, exceptions to this show of unity in slight error, since the south Indian calendars (such as the Kollam) and the lunar or luni-solar calendars (such as the Buddha Nirvana) follow different rules. Indeed, it would be hard to expect a dominant uniformity in the calendrical — or indeed cultural — variations within India, and what one has to look for is the interest that different users of distinct calendars have tended to have in the practices of each other. I shall argue later that this mutual interest extends also to the calendars used by Indian Muslims after Islam came to India. One of the tests of the presence of a united perspective in calendrical terms, already discussed, is the identification of a principal meridian and a reference location (like Greenwich in Britain). It is remarkable how durable has been the position of the ancient city of Ujjayini (now known as Ujjain), the capital of several Hindu dynasties of India (and the home of many literary and cultural activities through the first millennium AD), as the reference location for many of the main Indian calendars. The Vikram Samvat calendar (with a zero point in 57 BC) apparently originated in this ancient capital city. But it is also the locational base of the Saka system (zero point in 78 AD) and a great many other Indian calendars. Indeed, even today, Ujjain’s location is used to fix the anchor point of the Indian clock (serving, in this respect, as the Indian Greenwich). The Indian Standard Time that governs our lives still remains a close approximation of Ujjayini time — five hours and 30 minutes ahead of GMT. A contemporary visitor to this very modest and sleepy town may find it interesting to note that nearly two millennia ago, the well-known astronomical work Paulisa Siddhanta, which preceded the definitive Aryabhatiya, focused its attention on longitudes at three places in the world: Ujjain, Benares and Alexandria. Ujjain serves as a good reminder of the relation between calendar and culture. We have wonderful descriptions of Ujjayini in Indian literature, particularly from Kalidasa in the fifth century, perhaps the greatest poet and dramatist in classical Sanskrit literature. The elegance and beauty of Kalidasa’s Ujjayini even made E.M. Forster take a trip there in 1914. Forster wanted to reconstruct in his mind what Ujjain looked like in the days that Kalidasa had so lovingly described. He recollected passages from Kalidasa, including the stirring account of evenings when "women steal to their lovers" through "darkness that a needle might divide." But he could not get the old ruins there to reveal much, nor manage to get the local people to take the slightest interest in his historical and literary search. Ankle-deep in the river Sipra, so romantically described by Kalidasa, Forster abandoned his search and accepted the prevailing wisdom: "Old buildings are buildings, ruins are ruins. "6 I shall not speculate whether in that abandonment of historical exactness, there is something of a unity (perhaps illustrated even by the already-discussed factual uncertainty of the Kaliyuga despite its mathematical exactness). But certainly there is something very striking about the constancy of Ujjain’s dominance in Indian time accounting, even though the focus of political power, and of literary and cultural pre-eminence, shifted from Ujjain itself, a long time ago. Tradition can be a great ally of solidarity. One of the contrasts between the different Indian calendars relate to their respective religious associations. This was a matter of particular interest to that original multiculturalist, Akbar, as I have already discussed. He was especially concerned with the fact that as a Muslim he was ruling over a country of many different faiths. To that particular concern I shall presently return, but I would like to clarify that even before the arrival of Islam in India, India was a quintessentially multicultural and multi-religious country. Indeed, nearly all the major religions of the world (Hinduism, Christianity, Buddhism, Jainism, Judaism) were present in India well before the Muslim conquests occurred. The Indian civilisation had not only produced Buddhism and Jainism (and later on, the Sikh religion as well), but India had the benefit of having Jews much longer than Europe, had been host to Christians two centuries before Britain had any, and provided a home to the Parsees right from the time when religious persecution began in Iran. In fact, Jews arrived shortly after the fall of Jerusalem, Christians appeared at least as early as the 4th century, and Parsees started arriving by the 8th. The different calendars associated with these religions — Buddhist, Jain, Judaic, Christian, Parsee — were already flourishing in India, along with the Hindu calendars, when the Muslim conquest of the north led to the influence of the Hijri calendar. Islam’s arrival merely completed the picture of the comprehensive religious — and calendrical — diversity of India. The pioneering multiculturalism of Akbar included his taking an interest in the religion and culture of each of these groups. In his ‘House of Worship’ (Ibadat Khana), the people from diverse religions who were encouraged to attend included — as Abul Fazl noted — not only the mainstream Hindu and Muslim philosophers (of different denominations), but also Christians, Jews, Parsees, Jains, and even members of the atheistic Charvaka school. 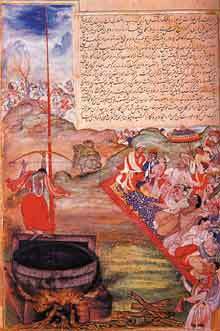 Even though Tarikh-Ilahi was introduced with a grand vision, its acceptance outside the Moghal court was rather limited, and the subcontinent went on using the Hijri as well as the older Indian calendars. While Akbar’s constructive calendar died not long after he himself did, his various synthesising efforts left a lasting mark on Indian history. But has the calendrical expression, in particular, of Akbar’s synthesising commitment been lost without trace? Not so. There is a surviving calendar, the Bengali San, which was clearly influenced by Tarikh-Ilahi, and which still carries evidence of the integrating tendency that is so plentifully present in many other fields of Indian culture and tradition (such as music, painting, architecture, and so on). It is year 1407 now in the Bengali calendar, the San. What does 1407 stand for? Encouraged by Akbar’s Tarikh-Ilahi, the Bengali calendar was also ‘adjusted’ as far as the numbering of year goes in the late sixteenth century. In fact, using the zero-year of the Tarikh, 1556 AD (corresponding to year 963 in the Hijri calendar), the Bengali solar calendar, which has a procedure of reckoning that is very similar to the solar Saka system, was ‘adjusted’ to the lunar Hijri number, but not to the lunar counting system. That is, the ‘clock’ of the calendar was put back, as it were, from Saka 1478 to Hijri 963 in the newly devised Bengali San. However, since the Bengali San (like the Saka era) remained solar, the Hijri has marched ahead of the San, being a lunar calendar (with a mean length of 354 days 8 hours and 48 minutes per year), and the Bengali San — just turned 1407 — has fallen behind Hijri as well. Like the abortive Tarikh-Ilahi, the more successful Bengali San too is the result of a daring integrational effort, and its origin is clearly related to the synthetic experiment of the Tarikh-Ilahi (and thus, indirectly, to Akbar’s multicultural philosophy). When a Bengali Hindu does religious ceremonies according to the local calendar, he or she may not be quite aware that the dates that are invoked in the calendrical accompaniment of the Hindu practices are attuned to commemorating Mohammad’s journey from Mecca to Medina, albeit in a mixed lunar-solar representation. The tradition of multiculturalism in India is particularly worth recollecting at this moment in Indian history, when India’s secularism is being sporadically challenged by new forces of intolerance and by politically cultivated fanaticism of one kind or another. What is under attack is not only some ‘modern’ notion of secularism born and bred in post-Enlightenment Europe, or some quintessentially ‘western’ idea brought to India by the British, but a long tradition of making room for different cultures which had found many articulate expressions in India’s past — partly illustrated by India’s calendrical history as well. While I shall not try to summarise the paper, it may be useful to point to some of the main subjects with which this essay has been concerned. First, India does have a remarkable variety of well-developed calendars. They provide useful introductions to certain aspects of India’s culture and society. In addition to discussing the principal Indian calendars, I have also tried to draw on their nature, origin and history to try to understand the country in which they have been in use. Some of the conclusions have been quite firm: for example, the recognition that the allegedly ancient Kaliyuga calendar, in its developed form, is not older — possibly significantly younger — than the Saka calendar (or the Vikram Samvat), or some non-Hindu calendars such as the Buddha Nirvana or the Mahavira Nirvana. Other conclusions, drawn on the calendric basis, are more conjectural, including the speculation that the traditional Indic culture has had much stronger attachment to mathematics and analytical reasoning than to observational science. This is no more than a tentative hypothesis, and at best, it suggests an elementary cultural question, rather than giving any kind of a firm answer. I must warn that I would certainly grumble if there were any attempt to link the recently emerging Indian dominance in computer software — or the manipulation of the Internet — as reflecting some kind of a millennia-old natural selection on the banks of the Kaveri or the Ganges! However, cultural — as opposed to genetic — predispositions remain interesting fields of investigation. Second, while the variety of Indian calendars indicates how deeply pluralistic the country has been over many millennia (well before the arrival of Islam), the tendency towards solidarity is also well illustrated by the calendrical systems, and particularly by the consistent use of a principal meridian. Ujjain served as the reference location for Indian time two millennia ago, as it does today, in the form of the Indian Standard Time. Third, the arrival of Islam and the dominance of Muslim rule have had a profound effect on India over the last millennium. But the consolidating tendency has continued, and it was given a particularly well-articulated form by Akbar, the Great Moghal. His integrating experiments, carried out in parallel in religion and in the calendrical system (respectively, through the Din-Ilahi and the Tarikh-Ilahi), may have been abortive, but the philosophy that they represented has had many integrative fruits. This is, of course, plentifully visible in Indian music, poetry, painting and in other cultural fields, and all this relates indirectly to Akbar’s attempt at calendrical unity which was a part of his general multicultural philosophy. As it happens, something of even the calendrical synthesis also survives in the form of the Bengali San — a legacy of the integrative effort initiated by Akbar. Caught as we are in India today in conflicting attempts to interpret Indian civilisation and society, the calendrical perspective offers, I believe, some insights that are relevant and forceful. The calendars reveal, in fact, a great deal more than just the months and the years.